You can cook dried chickpeas in a pressure cooker and make your own hummus from scratch. This recipe has simple ingredients, like olive oil, garlic and lemon juice, that you probably already have on hand. 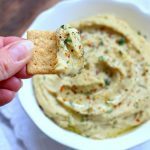 Hummus is a creamy and healthy dip that is perfect with crackers or raw veggies. For this Instant Pot Hummus (without Tahini) recipe I used this Instant Pot IP-LUX60 V3 Programmable Electric Pressure Cooker. It’s 6 quarts, so the same size as most slow cookers. It cost me around $80 on Amazon. When I cooked it in the slow cooker I used my 6 Quart oval Kitchenaid Slow Cooker.